Adult colouring books are a new trend that have exploded in popularity over the last year, which has led to a number of people wondering why. Colouring books have always been associated exclusively with children, so the idea of adults taking up this pastime seems a little strange to many. So why has this phenomenon taken off so suddenly? Well it is still a relatively new trend, so there has not been a lot of research conducted into this area yet, but there are a few theories out there that we can look at to try and understand the popularity behind it. Children's colouring books tend to feature just a few, large items such as an animal standing on grass in front of the sky. Adult colouring books on the other hand tend to feature much more elaborate and intricate designs that form very artistic pictures when finished. Many people see this as irrelevant, and think the books are just a difficult version of childish activity. Others disagree however, saying that it is the straightforwardness of the activity that makes it so enjoyable. There are no puzzles or problems to figure out, so the mind can relax and let our opinions and personal taste take over and come out. You do not become frustrated or feel bad for being unable to finish, as might happen with games like sudoku or crosswords. There is no confusion or difficulties that can't be overcome simply by sticking with it. These are some of the reasons that so many people enjoy it. Because it is an activity that lets our brains take a break from problem-solving and get back to a time when we could just let out whatever came to us. It is a challenge where we are never right or wrong, or where an unexpected problem can suddenly arise. We know exactly what it entails. Another theory is that when people see the finished product, they will get a sense of accomplishment purely because they invested so much time into it, and now it's finally finished. Maybe it didn't take a whole lot of skill to do so, but a lot of what we do in life could be considered easy. It doesn't take many skills to enjoy a movie, either. The whole practice could be compared to jigsaw puzzles, where we do not create the art per se, but we still feel satisfied when we reach the end, because we set out a goal for ourselves and reached it, and our prize is a beautiful picture. The first few times someone tries adult colouring, they might get a little lazy. The pictures are very elaborate, so they may be tempted to just colour all the plant stems the same shade of green for example. But even with that sense of accomplishment from finishing, people will want to do better. They will want to go back and colour the stems in front a lighter shade, and the stems in the back a darker one. It is the same exercise, same level of skill, but they can push themselves to be better. This is why many people claim that the activity is helpful for those with depression, as one of the major driving forces behind depression is a lack of motivation or purpose. We are psychologically predisposed to dislike leaving an activity unfinished, so adult colouring gives people an achievable target that motivates them as they go, and serves as an outlet for creativity at the same time. 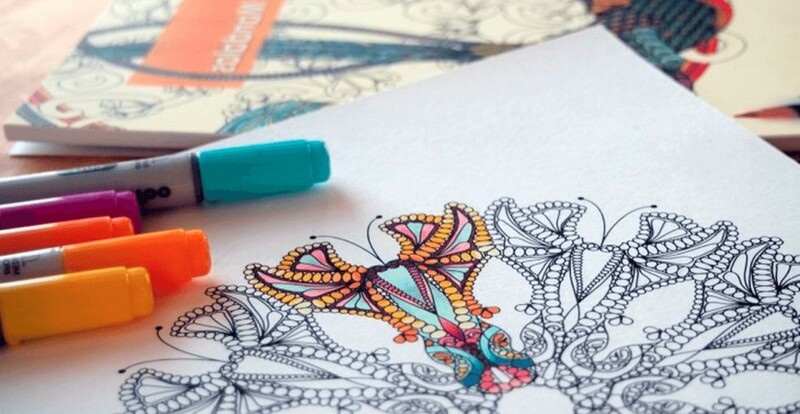 As mentioned before, people who enjoy colouring are likely to invest more time and effort into each page as they go. Every time they do it, they will be happy to spend a little more time to make sure they don't repeat any mistakes they made on the last ones. They may feel that they went outside the lines by going too fast, or that they could have used a better combination of colours for example. Whatever the problems people see in their pages, they will resolve to make sure they're not repeated, and they will be more patient each time. To draw some comparisons, a writer will not be satisfied with everything they wrote on the first draft, a chef will not just accept that they're steaks come out medium instead of rare, and a photographer will not just point a camera and click. We all have things that we like to be just so, and we endeavor to perfect. Proponents of adult colouring books say that this helps us to build up our drive and patience to beat ourselves every time, or keep trying until we get it right. Everyone has their preferred methods of relaxation, but there are a few reasons that this trend has become so popular for people looking to relax. We have already seen a few of these: it is straightforward, artistic, and there is a sense of accomplishment when it is finally finished. But in addition to that, it is an activity that gets us away from the 21st Century. We are not hearing about the economy, or watching violent TV shows. There are no screens or loud noises, and the only things that cross our mind are whatever features in the picture. The pictures themselves are usually nature images, such as flowers or birds, so this also brings to mind a more serene side of the world that we often forget about. Not only are we giving our brains a break from the challenges that we face in the modern world, but we are also subconsciously remembering that there is a simple, beautiful side to it too. There has not yet been a large amount of research in this area, so it is important not to overestimate the ability of colouring books to address mental health issues. That being said, initial research has found that the belief behind this movement is not unfounded. Veteran's suffering from PTSD in the US have used colouring books to transition into creating their own art, which then allows them a creative outlet to express their troubles. Other studies have also shown that stressed college students and people who have difficulty sleeping have been helped by adult colouring books. The trend has become so popular that the world's biggest manufacturer of colouring pencils has had to double its output to keep up with demand, so there are clearly a lot of people who believe this works for them. While many people might laugh the idea off, if you think it's something that could help you unwind, there's no harm in trying.